Here’s where a responsive tax service like Brian Alfred really comes in handy. Imagine losing out on £66 million just for waiting on the phone. Then tacking on £21 million after you actually got through. Followed by another £10 million just paying for the call. “Long waiting times not only cause frustration and increase the cost of the call, but can also mean people miss important deadlines,” Gillian Guy, chief executive of Citizens Advice, told the BBC. In all, no debt or penalties are worth the lost time. Looking at it from your side, the staff at Brian Alfred figured out a long time ago that you have better things to do than wait on line for an hour. At the end of the day, it’ll be satisfying to know that you’ll get the most out of your money and not have to worry about being on the phone all afternoon with HMRC. With Brian Alfred, you can have that peace of mind. Let our responsive tax service experts handle your queries with HMRC for you. Our history bears it out – we know it can feel like an uphill struggle dealing with HMRC and accountants, and that’s why Brian Alfred is here today. We were founded by the son of a builder who got a rough deal from his accountant. We understand that filing a tax return can be a slow and painful process. But at Brian Alfred, we pride ourselves in taking away all of the hassle AND paying out your tax rebate in just 24 hours! Want to find out how we can get you the maximum tax rebate in just 24 hours? 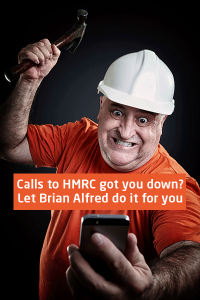 Then give us a ring on 0800 073 1218, or email us today tax@brianalfred.co.uk.